So good I dreamed about it! This is one I made awhile back and forgot about. Not sure how I let that happen because I loved it. Hubby loved it. Even picky daughter loved it. All that plus the fact that I keep every single ingredient on hand all the time so it's the perfect pantry meal. Fortunately last night I had a dream. 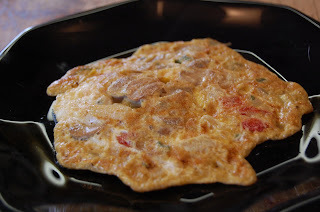 And in that dream I was whipping up these delicious Asian-inspired Egg Foo Yong omelets for Sunday morning breakfast. Of course once I woke up, nothing else was going to satisfy my hunger so I did indeed mix up a batch of these delicious eggy treats.On the negative side, apparently my camera skills have not improved much. The new pictures were ... not appetizing to put it nicely. (See below.) Here's a shot from the first go round. This time I had them on hamburger buns with fresh tomato and a dollop of mayo. Heavenly! splashed with soy sauce and eaten with a fork. Heaven on a plate! Heat 1 tablespoon oil in a nonstick pan over medium high heat and sauté scallions, onions, mushrooms, peppers, bean sprouts, ginger and water chestnuts until softened, about 5 minutes. Add garlic and cook another minute. Do not allow garlic to burn, it will become bitter. Set aside to cool. In a medium bowl, beat eggs with soy sauce and black pepper, add vegetable mixture and stir until all ingredients are fully incorporated. Add remaining tablespoon of oil to non-stick pan over medium heat, ladle 1/6 of egg mixture into pancake-like shape, cook until golden brown, approx. 2 minutes on each side. Continue making 5 more patties, one at a time, with remaining mixture. Serve on bread or bun of your choice, with whatever you prefer. This would make a great meatless dinner too. Love it! By the way, my friend Laura, from "Hey What's for Dinner Mom?" is hosting a blog feature called: "Just another Meatless Monday" ... if you want to like up this recipe over there, she'd be glad to have you. Thanks for stopping by my blog! 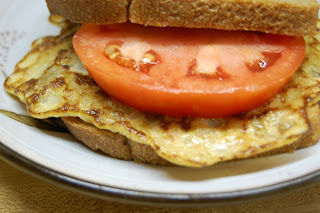 I love egg foo young, but have never made it myself. My dad would make it, or I get it from Chinese take out! Whoa! I have never thought of making egg foo young at home. How interesting. I bet my kids would like these and I bet my husband would too. Plus with all our fresh eggs from the chickens we'll never go hungry. Thanks so much for linking in and giving such great idea! I hope you get inspired by some of the posts too.